Last weekend Yoshi and I escaped Tokyo to Tohoku (northern Japan). We were there for a friend’s wedding but also managed to squeeze in a day trip to Hakkoda. I really can’t think of a better way to shake off those big city blues. 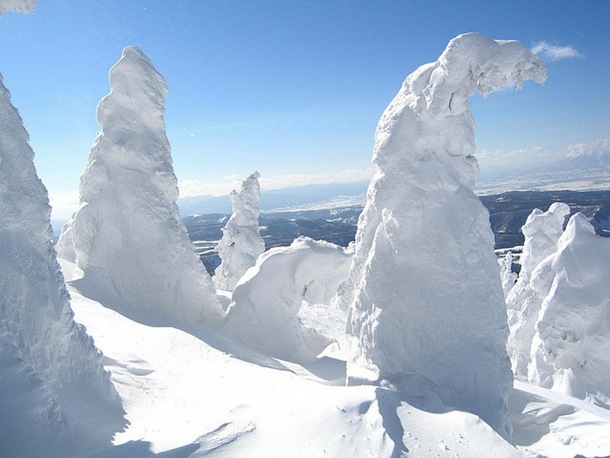 Hakkoda is located in Aomori Prefecture, at the northernmost tip of Honshu, Japan’s main island. It’s a wondrous, magical place in all seasons, although it really comes into its own in winter. 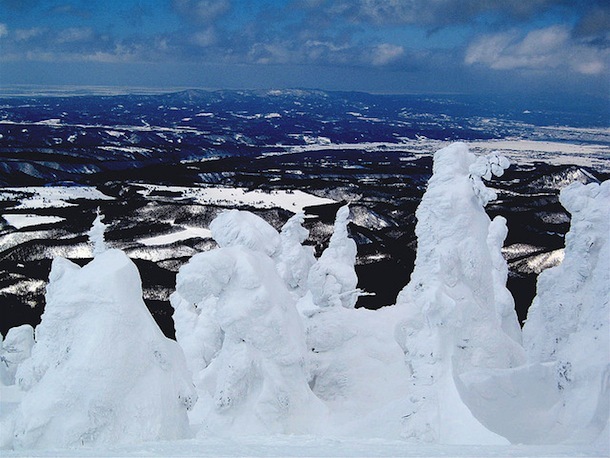 In winter, Hakkoda is covered from head to toe in meters of light, dry, powdery snow. For snowboarders and skiiers, there are two courses, both offering lovely long rides. They’re not groomed and if you get there early enough on any given day, you might find yourself faced with the task of forging the path. With a knowledgeable guide, you can also access miles of back-country. Boarding and skiing opportunities aside, this is quite simply an awesome place to get down with nature. There are beautiful big trees that have morphed into snow monsters and created deep craters known as tree wells. There are moments when you’re completely alone in the middle of the mountain and the forest is dead still, white and quiet. When you can see, there’s a view from the top out to the ocean. When you can’t, it’s you versus the elements and you’re reminded (frequently) of your mortality. All this already makes for a pretty special snow experience. Hakkoda’s icing on the cake is a delightful restaurant at the foot of the mountain called Hakkoda Sansou which serves up hearty dishes like ramen, Japanese curry and ginger pork. Its chocolate sprinkles are the abundance of nearby onsen. Frankly, I’d be hard pressed to think of a better day out than one including a mountain workout followed by lunch at Sansou and topped off with a dip in sulphuric Sukayu on the way home. We got back to Tokyo with aching muscles and smelling slightly of egg but with big smiles and a feeling of relaxed contentment. Thank you Hakkoda! This entry was posted in Explore, Tokyo. My favourite things about skiing in Japan are curry, beer and onsen! Wow – I love skiing but never thought of skiing in Japan. These photos are breathtaking.